Auto Glass by Jerry services glass for all types of vehicles. Chips caused by rocks or other road debris striking the windshield can sometimes be repaired without having to replace the windshield, saving you money! Auto Glass by Jerry comes to you to deliver auto glass repair services in Rockwall, Wylie, Garland, Grand Saline, Plano and several other north Texas communities. Auto Glass by Jerry is certified to file claims directly with your insurance company, making your repairs convenient and pain free. Auto Glass by Jerry has provided superior auto glass repair and windshield repair and replacement in Rockwall, Garland, Mesquite and around north Texas since 2000 - longer than any other auto glass company in Rockwall. 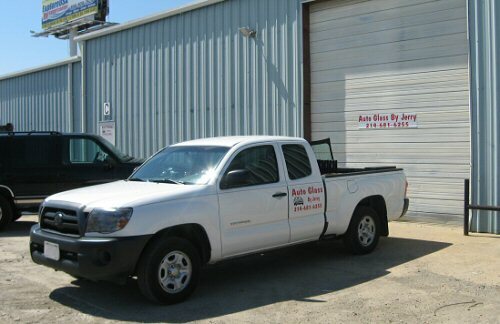 Repair serviceable windshields, windows and other auto glass for all makes and models of cars and trucks. Replace non-serviceable windshields, windows and other auto glass using ONLY quality OE auto glass - the same windshields used by auto manufacturers. Windshield chip repair - in many instances your insurance will pay 100% of this service, making windshield chip repair FREE to you. Lifetime warranty on our auto glass work. FREE mobile service to Rockwall, Garland, Mesquite, Royce City, Greenville, Forney, Rowlett, Terrell, Caddo Mills, Wyle, Plano, Sachse, Grand Saline and other communities in North Texas. Same day service usually available. Five-star insurance-approved shop with NO shop fees. Claims filing with any insurance company so you don't have to pay the full price to us and file an insurance claim yourself. Has your electric windows stopped working? 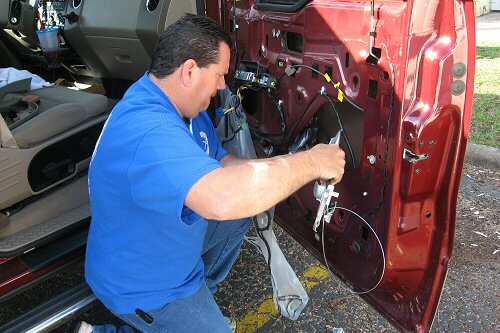 We can replace window motors and regulators in your car's doors. Bonded and certified glass technician will service your vehicle. We bring the windshield repairs to you with our free mobile service. We provide a solid quote in advance and we do not add any hidden fees. When we're finished we are certified to file directly with your insurance company to make it easy for you. In all other cases we accept Mastercard and Visa. Jerry is a certified glass technician from Dow Products of America Association and we are Rockwall's ONLY authorized installer for Pilkington Automotive Glass. This is typical of our commitment to use only the best quality OE glass and deliver auto glass services with your safety in mind. We a family-owned Christian business, not a franchise business someone just bought. We have lived in Rockwall, Texas for 20 years - we're your neighbors, part of your community. And that's how we treat our customers, with the special service you'd expect to receive from a neighbor and friend.